Northeast Virginia’s railroads showcased Civil War creativity that was both constructive and destructive, and originated with soldiers and civilians as well as with generals and other top officials. Prototype, customized, or infrequently seen structures, equipment, extensions, alternatives, and practices appeared along or were proposed for the region’s iron arteries. Those often offered previews, with technical or procedural novelty that had appeared along one line reappearing along another. What follows is a sampler of the lesser-known, novel developments during the first year of wartime operations along the Richmond, Fredericksburg and Potomac Railroad (RF&P). 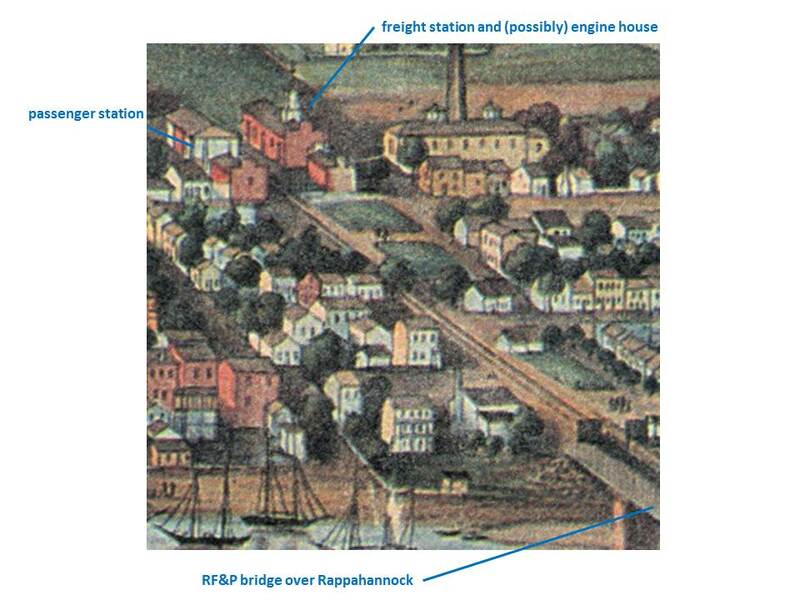 The RF&P’s Fredericksburg railyard and its approaches from the Rappahannock River bridge in 1856. This area, extending several blocks from river’s edge to the station buildings, was the scene of nerve-wracking but creative moments for Southern forces in 1861 and, a year later, for Northerners. Looking west. Detail from Edward Sachse chromolithograph, copy in collection of Fredericksburg & Spotsylvania NMP. At the time of Fort Sumter’s bombardment, the RF&P’s uppermost segment extended 14 miles north of Fredericksburg and the Rappahannock River. The railroad then lacked a trackside telegraph-line, and its managers feared surprise by Federals coming ashore at Acquia Creek landing. That place marked the RF&P’s northern depot, at the mouth of the creek on the Potomac River. Acquia boasted a hotel; an engine house; fishery buildings; and a long, shed-roofed railroad wharf where in peacetime passengers and freight had transferred between trains and steamboats. 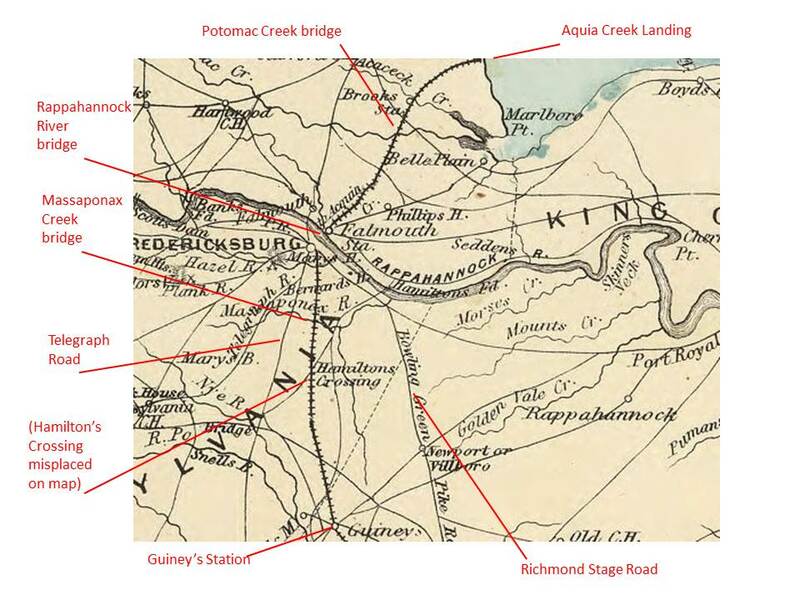 The Acquia Landing-Fredericksburg and Fredericksburg-Guiney’s Station segments of the RF&P Railroad, 1860’s. North at top. Courtesy Library of Congress. If any of the citizens exhibit any alarm [emphasis original] you can tell them that we will keep the Engine at [Acquia] Creek fired up all the time so that in case…any vessel come[s] in sight that looks suspicious or anything else[,] we will run the train direct to Freds’burg to give the alarm to the citizens…. 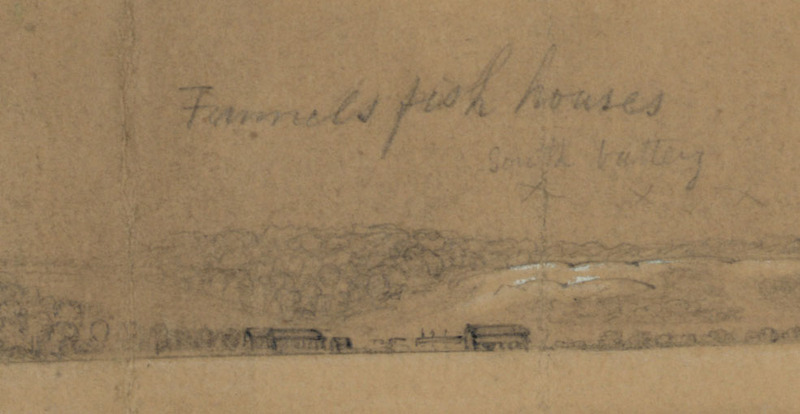 Detail from an undated, rarely seen Alfred Waud sketch of Acquia Landing and environs, showing the cluster of huge buildings that probably housed the salting, drying, and storage operations of Walter Finnall’s Fishery. The Fishery complex was one of the most prominent but also the shortest-lived of the wartime Acquia landmarks, surviving the ship-to-shore fighting of May 31/June 1, 1861 but removed before or during the first Union occupation in the spring of 1862. (The wharf and hotel are just outside this view, to the right; the railroad extended from left to right and a short distance behind the Fishery buildings in this perspective.) Courtesy Library of Congress. [T]he enemy sent down an old passenger steamboat, the Mt . Vernon, which had formerly been used to carry the mail between Aquia and Washington City, no doubt to see what we were about. [A] messenger was dispatched with the news. Ample time was allowed, during a ride of sixteen miles, for him to imagine all kinds of wonderful things; and by the time he reached head-quarters [at Fredericksburg] it was asserted that a fabulous number of vessels of war of the largest class were landing untold hosts of Yankees at the Creek; that they had already captured the works, and were advancing rapidly by way of the railroad on Fredericksburg. [The town] was thrown into alarm and excitement. Trains were ordered to be fired up. All the troops…turned out under arms, while staff officers dashed about in a manner truly wonderful to behold. General Ruggles’s forces had by this time been increased to five or six companies of infantry.